Several years ago I received e-mail from “Ed from New Jersey” who had some 8mm film taken in 1956 when George Reeves appeared in Palisaies Park. I posted his story here and in 2013 posted his video on You Tube. I was there that day with my sister! 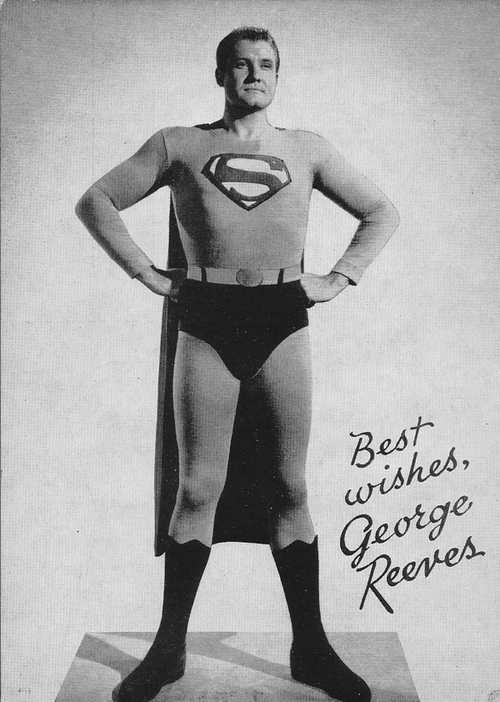 And I spoke with George Reeves. I was 7 at the time. My family had moved to Cliffside Park earlier that year. When I heard that my hero, Superman, was coming to the Amusement Park, I had to go and so my big sister, who was 14, took me. When he came on stage, they played that "Superman flying" sound from the show and he jumped from the wings as if he were landing. Looking back, it must have been pretty cheesy, but to a kid it was great. He spoke for a while, but sadly I don't remember any of it. After the show, there was something like a receiving line. We all got to speak with Superman for a moment, and we got this really cool publicity photograph. Wish I still had it. The memory of that day has faded quite a bit, but I will never forget standing just two feet away from Superman. I was face to face with the "Man of Steel."